(Canada Geese (Branta canadensis) - Sentry Duty) While quietly paddling our way into a quiet shallow part of Sleepy Hollow Lake, we spotted a goose standing sentry duty on a silt peninsula. As we looked closer we saw his wife sitting on their nest. We stopped paddling and took this picture. We cannot understand how anyone could ever desire to harm these magnificent, loving and family oriented birds. (Canada Geese (Branta canadensis) - No Apparent Danger) The gander kept a watchful eye on us for several minutes as we sat quietly in our canoe. Then, sensing that we presented no apparent danger, he walked over to the opposite side of the peninsula and began to preen himself with just an occasional glance towards us. We have heard hunters say that they really enjoy watching the wildlife more than hunting. If this were true, then they would not need to take their guns along. They could go out with a camera as we do, and enjoy the animals' lives to the fullest. In our opinion, to kill any living being in the name of sport is to express the most depraved side of humanity. (Canada Geese (Branta canadensis) - Is There Danger Again?) A small gust of wind came up and caused our canoe to drift closer to the geese. The gander immediately returned to his sentry duty to ascertain our intentions. How nice it would be if all of God's creatures could truly love God and each other so that we would no longer have any fear of one another. 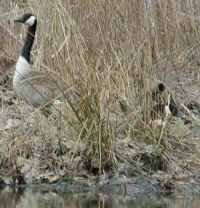 (Canada Geese (Branta canadensis) - Relaxing Again) We slowly paddled our canoe away from their nesting site. 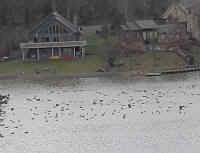 As we moved away, the gander walked over to our side of the peninsula to make sure that there was no longer any apparent danger. Seeing none, he once again returned to preening himself. If we stopped killing the animals that God charged us to protect (Genesis 1:26, 28), we would come to once again learn to trust each other and to become one another's companions as God originally intended. (Canada Geese (Branta canadensis) - 06) This is a family of Canada Geese, with young ones almost ready for their first flight. (Canada Geese (Branta canadensis) - 06a) This is a closer look at Mom, Dad, and all but one of the children. 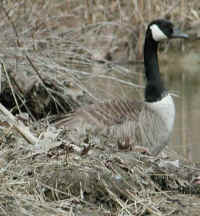 Canada geese are native to North American Arctic and Temperate regions. Sometimes these beautiful birds are mistakenly referred to as Canadian Geese. 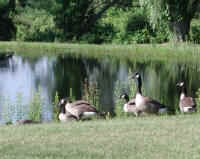 (Canada Geese (Branta canadensis) - 07) This is another view of the family of Canada geese. Canada Geese can live for up to 24 years, and is 76–110 cm (30–43 in) in length from head to tail, with a 127–180 cm (50–71 in) wingspan. The male usually weighs 3.2–6.5 kg, (7–14 pounds), and can be very aggressive in defending territory. The female looks virtually identical, but is slightly lighter at 2.5–5.5 kg (5.5–12 pounds). 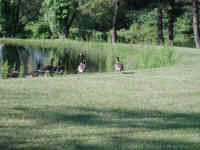 (Canada Geese (Branta canadensis) - 07a) This is a closer look at the family heading into the water for a swim. 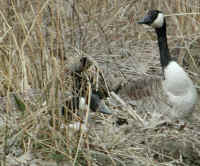 Canada geese mate for life. (Canada Geese (Branta canadensis) - 08) And then one day, the family takes to flight! 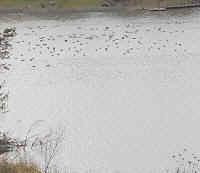 (Canada Geese (Branta canadensis) - 09) This is a small flock of Canada geese that didn't migrate south for the winter. We took this photo on 22 Feb 2011. 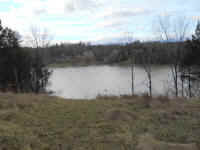 The Catskill Mountains can be seen in the background. (Canada Geese (Branta canadensis) - 10) This is another view of the Canada geese resting in a cut section of a corn field that is near Sleepy Hollow Lake. (Canada Geese (Branta canadensis) - 11) We took this and the following photos of a flock of Canada geese resting on Sleepy Hollow Lake on 16 Dec 2011. It brings a joy to our heart to watch these magnificent animals living their lives as God intended. 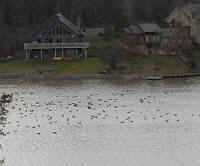 (Canada Geese (Branta canadensis) - 11a) This is a closer look at the flock of Canada geese resting on the lake. (Canada Geese (Branta canadensis) - 12) This is another look at the Canada geese on the lake. 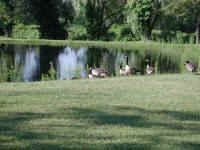 (Canada Geese (Branta canadensis) - 13) This is the last photo that we took of the Canada geese before we continued on our walk.